Don't miss any of the nightly recaps! Subscribe to Nik Snacks' email list HERE. Follow nightly on Facebook and Twitter. 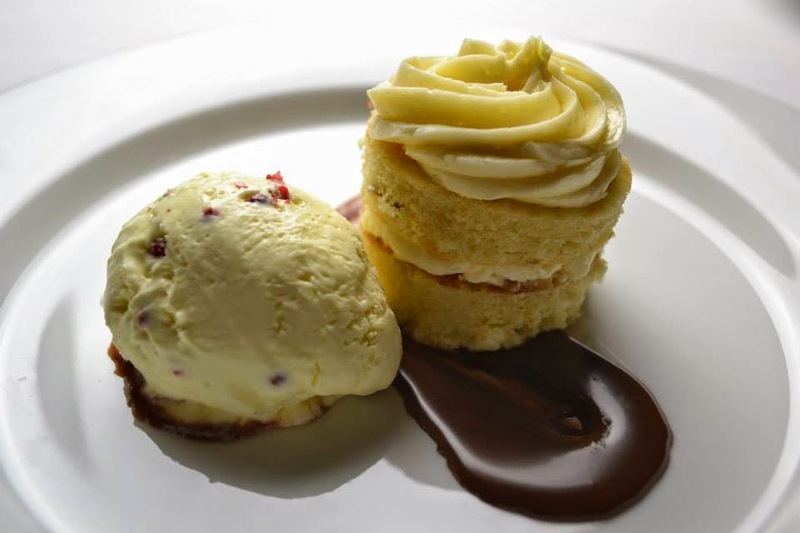 Use #CompDiningNC to get in on all of the #localfood fun! 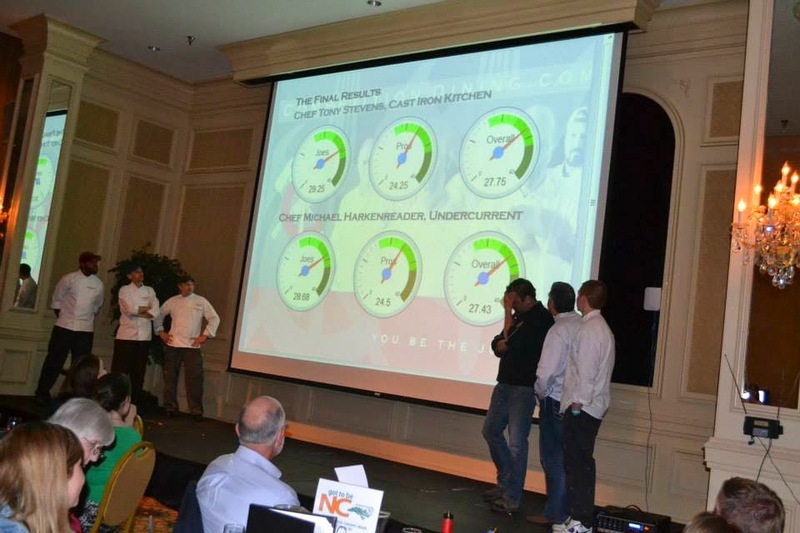 About Competition Dining: In 2014, this unique 15-dinner competition dining experience has traveled across the state of North Carolina to Asheville/Blowing Rock (Fire on the Rock), Wilmington (Fire on the Dock) and Greensboro (Fire in the Triad). Raleigh (Fire in the Triangle) and Charlotte (Fire in the City) are slated for later the summer and fall. This is Harkenreader's 3rd appearance in Fire in the Triad. 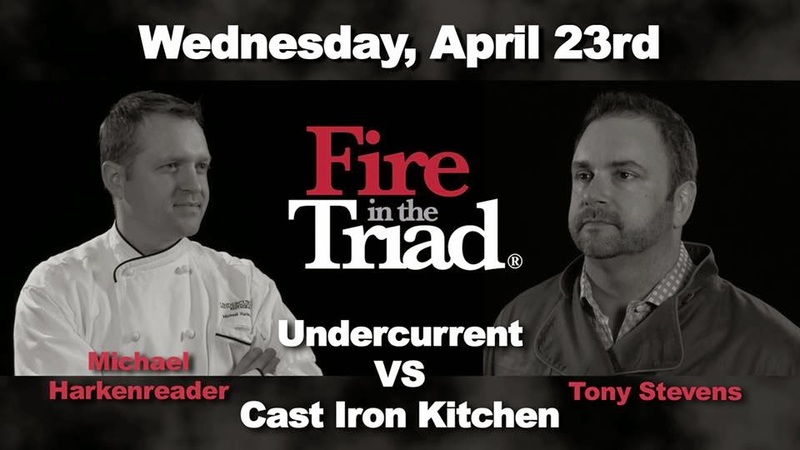 In 2012, made it to Fire in the Triad finals and lost to chef George Neal of 1618 Seafood Grille in Greensboro. Meet him & find out a little more about him below. Tony Stevens Cast Iron Kitchen in High Point is a relative newcomer to the scene. A month ago, I did not know Cast Iron Kitchen existed. High Point is not known as a culinary destination, but that may change now that Stevens is on the scene. Stevens says "My competitive advantage is that I have 20 years ownership experience, which makes for competitive quick thinking." This is Stevens' and the restaurant's 1st Fire in the Triad appearance. Your first time eating sushi with a fork? I do. It was last night. Last night was also the first time I can remember in a long time that each course just kept getting better and better. Playing to a smaller crowd than the previous night, the pace between each course was faster than any dinner in recent memory and each course was more delicious than the one before it. Guest judges: Serge Falcoz-Vigne, former Fire in the Triangle semifinalist of 518 West in Raleigh; Kyle McKnight of Highland Avenue Restaurant in Hickory, NC; Creighton McNeil, chef of Greensboro's Liberty Oak, former Fire in the Triad AND Fire on the Dock competitor. Other noted luminaries in the building: revered food critic and author, John Batchelor; NC Beer Guys, Glenn and Dave; co-owner Ryan Blaine of Small Batch Beer Co. As NC Beer Month winds down, the offering of beer at Competition Dining is heating up. Each night, there will be a different NC beer and NC wine pairing available for purchase. No matter if it be beer, wine or food, It's Got To Be NC! The pro judges scores account for 30% of the total vote. The "joes" or the regular diners (you and me), account for 70%. This was the first time I'd ever eaten sushi with a fork. 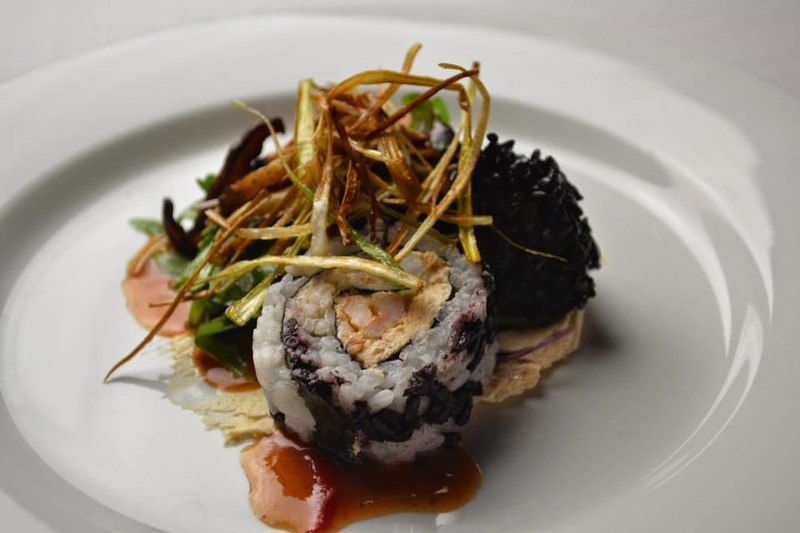 The plate was beautifully composed with the roll sitting atop a bit of dressed arugula, and the crispy leeks were shy and peeked over the top and the Chinese black rice were like little river pebbles, tasty river pebbles that were perfectly cooked grains of rice. The chèvre was definitely highlighted here in this beautiful dish, but there was a half-slice of tomato that looked pretty on the plate but needed salt. Hot house tomatoes in April are a good idea sometimes. Not this time. Highest scoring dish of the night with a little over 32 out of 40 points, this course hit all cylinders (salty, sweet, sour, savory, and pretty). This course was so beautiful, I almost didn't want to eat it. 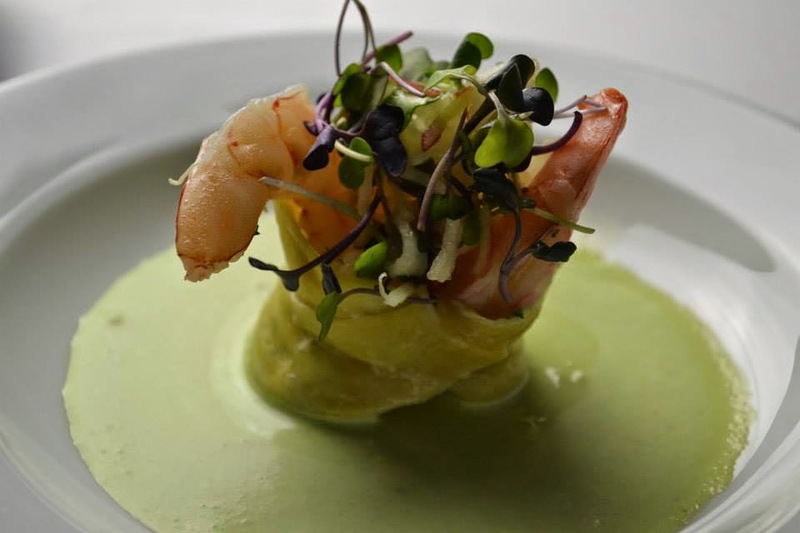 Cradled inside the lone tortellini, were two perfectly poached shrimp, fanned out perched ever so gently on their ends with delicate shreds of apple and fennel swirled over them. Inside the tortellini--that's where the party began. The finely chopped herbs and the tangy chèvre were so flavorful! The arugula cream was more of a arugula broth with tiny bubbles in it, but it was a perfect shade of mint green and I just couldn't get over the beautiful composition. Another favorite of mine, I'd absolutely order this dish in a restaurant. Typically, I never order duck. 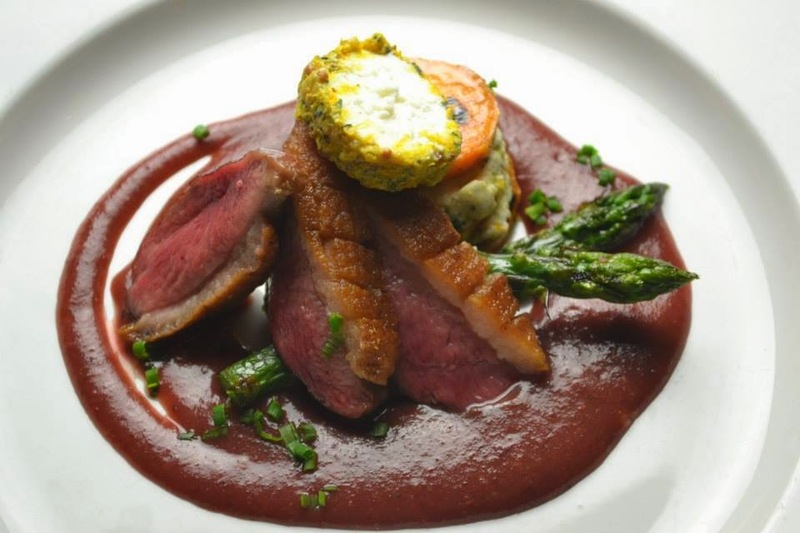 Duck is a favorite of Competition Dining competitors and I get my fill during the two months of the year of competition. That being said: I'd eat this again. As soon at the plates hit the table, everyone at my table commented on the aroma of this course. The duck was perfectly cooked and the skin was rendered to perfection. The sweet potato napoleon was delicious, but the cake of mustard-cured chèvre on top was over-the-top. It was a little too much chèvre for one plate but the I was glad for the molasses plum puree. For once, there was enough of it on the plate (thank you, thank you, thank you) and it was thick, rich, with a slight tang (maybe from cloves?) I was not expecting. Again, another stellar course. The presentation was very simple, but the pork belly was outstanding: very smoky and nestled next to a small daube of highly flavorful dauphinoise sweet potatoes. I was expecting watery, flavorless pork but that thought was soon dashed right out of my head with the first bite. Fork-tender (I didn't need a knife!) and still juicy, the smoke took over any doubts I had about the meat. The bits of port-infused figs had a deep, rich, sweet flavor that matched very well with the potatoes and little leaves of fried spinach, which freshened up the plate a bit. Second highest scoring dish of the night, this was my least favorite up to this point in the evening and it was still flippin' fantastic. In all of my years on this earth, I've never had baklava. And I can honestly say I've still never had it. 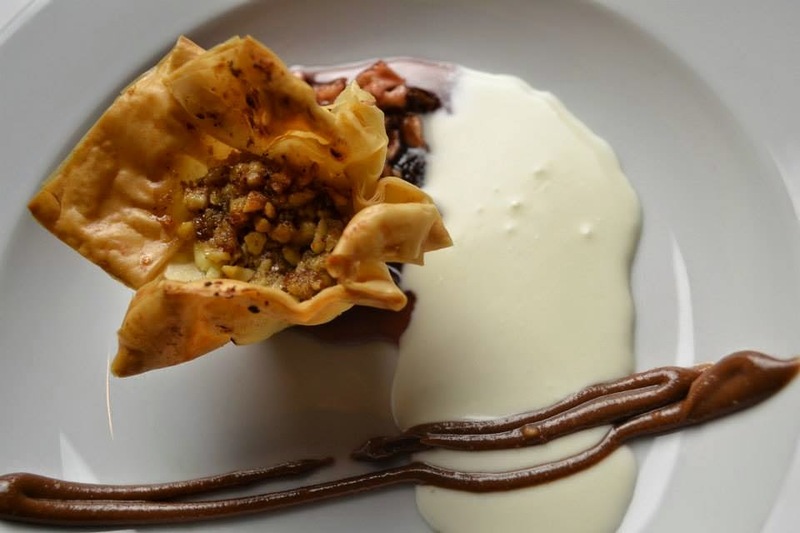 My "baklava" was a nodule of baked chèvre inside of a fillo cup, sitting atop the dried fruit (apples and cherries, I believe) gastrique, next to a stripe of chocolate chèvre and a pool of honey chèvre sabayon. Other diners seemed to enjoy the sweet, walnut-filled baklava. The presentation was amazing. The baklava cup looked just like a morning glory. I was highly impressed. The flaky layers of the fillo were buttery and a perfect vehicle for the diced bits of apple in the bowl. Two thumbs up for this course. 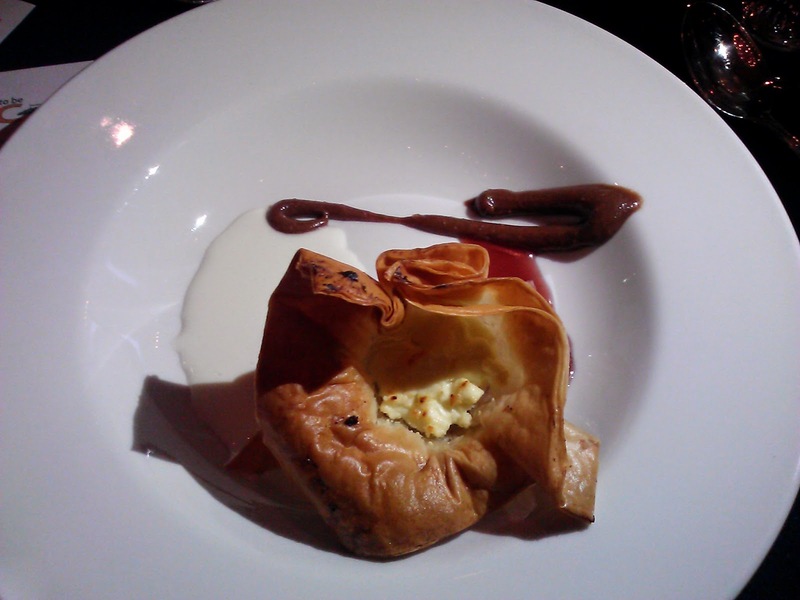 As soon as I saw smoked chocolate sauce, I knew who was responsible for this course. Two of my favorite things on one plate? Smoked chocolate AND pink peppercorns? Get back, Jack! This course caused much debate and dilemma at my table. Semifreddo = ice cream and the whole pink peppercorns were overpowering and much too strong for the delicate nature of ice cream. The ginger pound cake and the buttercream inside and on top of the pound cake layers were perfect. I love a good ginger anything and this fit the bill. It was a little sweet, very spicy and the spice of the ginger matched the spice of the peppercorn, but then the peppercorn was too much. There were whole pieces of chèvre in the semifreddo and that was a little undesirable. 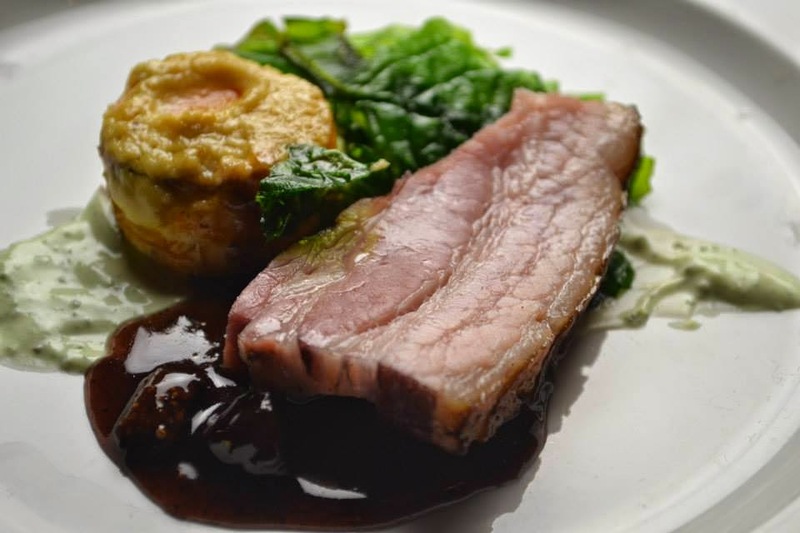 The smoked chocolate sauce paired well with EVERYTHING (I mean, how can it not?!) but it was hard to eat everything in one bite and truly appreciate the complexity of this course. one of my mom's friend was a popular French chef in Winston-Salem and he offered to create a cake for my birthday to be delivered to my class at school. To date, it was the most gorgeous cake I've ever seen. It was a chocolate genoise covered with chocolate Italian meringue and flowers, bunnies and tiny little bluebirds made of marzipan. It was dusted with pearl luster and sanding sugar. It was a masterpiece. Well, French 9-year-olds LOVE marzipan. American 9-year-olds... not so much. It was not a hit and I was lucky there was vanilla ice cream served with the cake that day. Course 6 was not a hit either. The pros and the joes voted with their palates and Chef Tony Stevens of Cast Iron Kitchen along with his brother, won battle Goat Lady Dairy! It has to be noted, Cast Iron Kitchen squeaked by with .322 hundredths of a point difference. After the final numbers were shown on the big screen, Chef Tony could be seen covering his face in disbelief. Talk about upset! This dark horse and his team came virtually out of nowhere and took it. Well, guys--buckle up. May 13th is going to be a bumpy ride. If you've not purchased your tickets yet, get a front show seat (or maybe its a front row fork???) to the best show in town. Go to competitiondining.com for more photos, tickets and general information about the Got To Be NC Competition Dining Series.